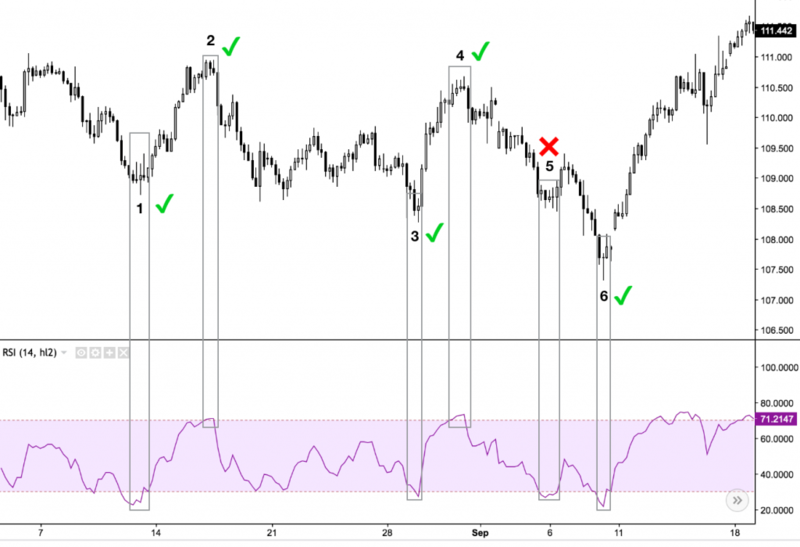 In this article, I will introduce you the RSI indicator and give you some trading tips. I will show you the basics, and explain how it works, so you can better understand its potentials for building technical trading systems. 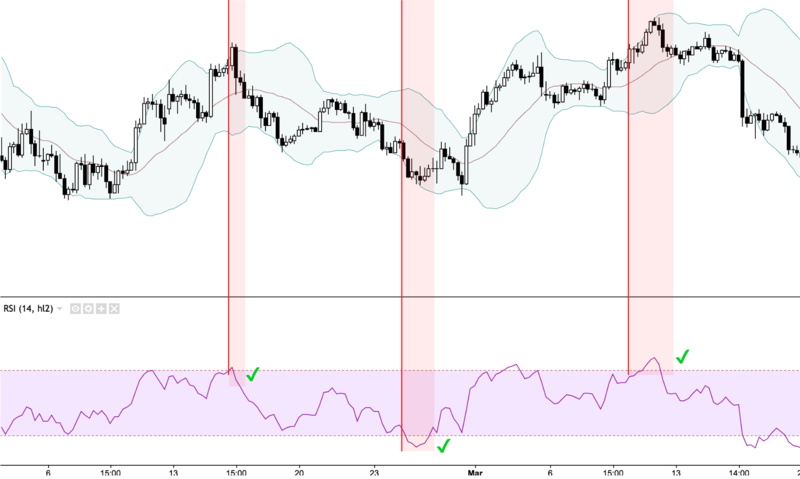 RSI indicator itself won’t help you learn forex or read markets news. Relative Strength Index RSI is a technical indicator that measures speed and change of the price movements. If you are trading price action this indicator will be definitely helpful during technical analysis. You can set the period RSI in the same way as with Bollinger Bands or moving averages. The default setting for the indicator is set to 14. The indicator then measures the last 14 candles (14day RSI) in the graph and evaluates the speed and change in the price movement. The RSI indicator analyzes the last 14 candles and examines how many of them are green (growing) and how many of them are red (declining). It also measures the size of each individual candle. The indicator simply shows overbought and oversold levels. This is the indicator itself. There is a different color band between values ​​ 30 and 70, because the price moves usually between these values. How is the indicator’s value made? On the price chart above you can see highlighted 14 last candles in the picture. 9 candles are bearish, the market had been falling. 5 candles are bullish, the market underwent correction. RSI is 37.85, which means that the market is in the undervalued area and there is a possibility for a turn and further growth. Where RS = Average gain of up periods during the specified time frame / Average loss of down periods during the specified time frame. How to trade RSI indicator? Rectangles indicate the penetration of the lower or upper level of the indicator. At the top you can see a chart, specifically USDJPY, 4h, where RSI works with a very good accuracy. Notice how predicted trend turned in 5 from 6 cases, which always meant a minimum of 150 pips for the trader. Only signal number 5 was not correct. RSI also helps us to indicate the power of the trend. Note the red sections, where the RSI curve penetrated the important levels 30/70, but the price continued in the previous trend and did not turn immediately, but the change occurred after the curve returned to the band. The second section from the left represents a very common scenario. The RSI level 70 is penetrated, but the price is still slightly rising and then stagnates. Once the line of the indicator comes back to the main band, the price starts to fall. In the third part, on the 17th day, there was breakdown of the lower level 30, and instead of the turn, the market went sharply down. The price has started to grow slightly after the line has moved back to the blue band of the indicator. Therefore, it is not good to enter to the trade immediately. Penetration of the band may also signal a strong trend that may take several days until the line returns to its 70 to 30 band. How do I get maximum from RSI? In the chart, you can see marked red all the main penetrations of the 70 to 30 band together with penetrations of the Bollinger outer bands. By combining these two indicators and entering to the trade when both indicators signal the input at the same moment, you get more accurate inputs. 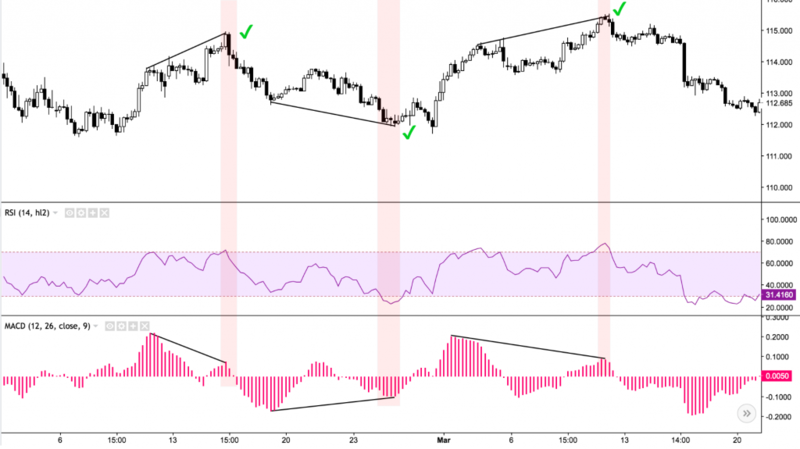 If the RSI line penetrates the 70 to 30 bands, it signals possible change of the trend, you should not enter to the trade immediately. It is better to wait for the return of the line back to the band and then look for the ideal entry.